A little sweet, a little smoky and with just a hint of spice. Our flavor-packed authentic chicken fajitas prepared with a guajillo chile adobo rub is the perfect dish for a weekend crowd. Three colors of bell peppers give it some visual pop. 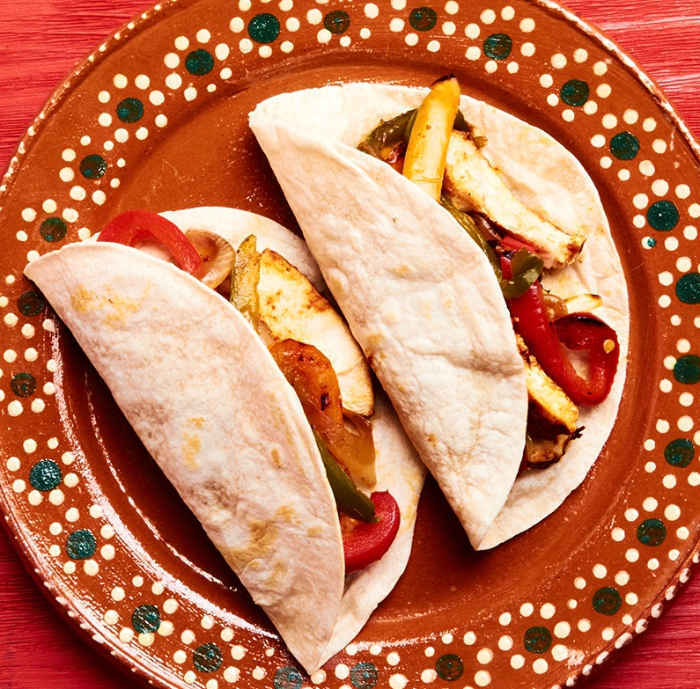 Stuff some flour tortillas for the best chicken fajitas tacos ever! This isn’t a dish that you can whip up in 30 minutes for an easy weeknight dinner. It’s not a difficult dish but you need some time to prep all of the different parts plus you need to allow time for the chicken to marinate. The effort you put into it is well worth it. Don’t be put off by the work required. Trust us! 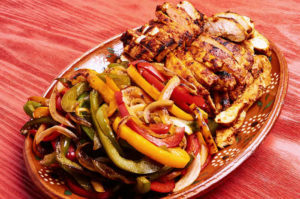 Step 4 – Serve the Fajitas and Enjoy! This adobo is a wet rub prepared mild fruity tasting guajillo chile, tomato, onion, garlic, brown sugar, salt and, vinegar. The rub is what gives the chicken it’s rich taste. Toast the chiles for about 30 seconds per side. Just until they become fragrant and pliable. After you have toasted the chiles and they have cooled to the touch use your fingers break them apart and remove the seeds and stems. 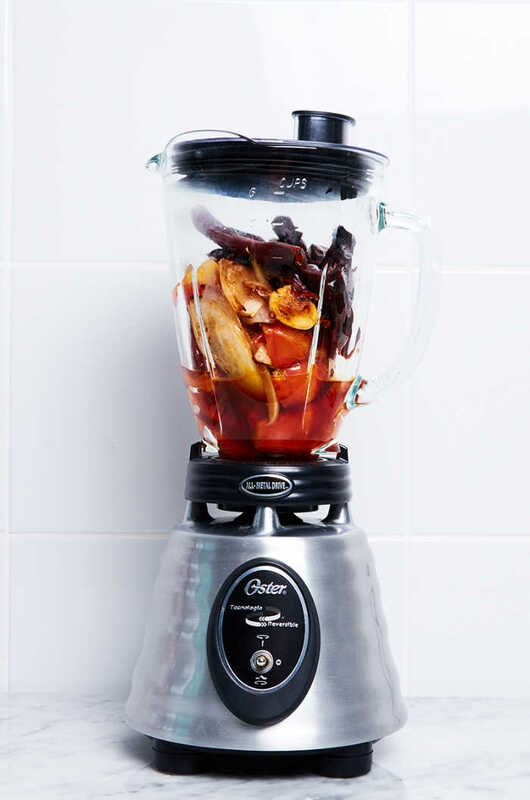 Remove seeds and stems from the guajillo chiles. Discard stems and seeds. Place the chiles in a pan and then add just enough water to cover. Bring the water to a boil and then turn off the heat. 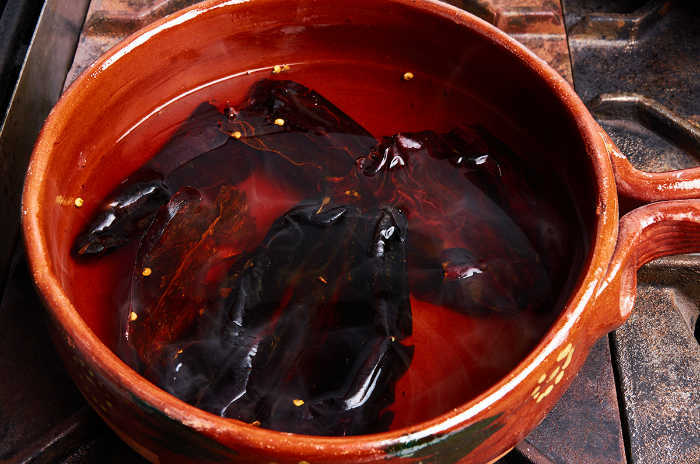 Allow the chiles to soak for 15 minutes until they have reconstituted and become soft and pliable. Soak the chiles for 15 minutes. Cut the onion and tomato into large pieces. Add them to a pan with 4 tablespoons of preheated oil. Cook the vegetables until they begin to char. Char the tomato, onion, and, garlic. 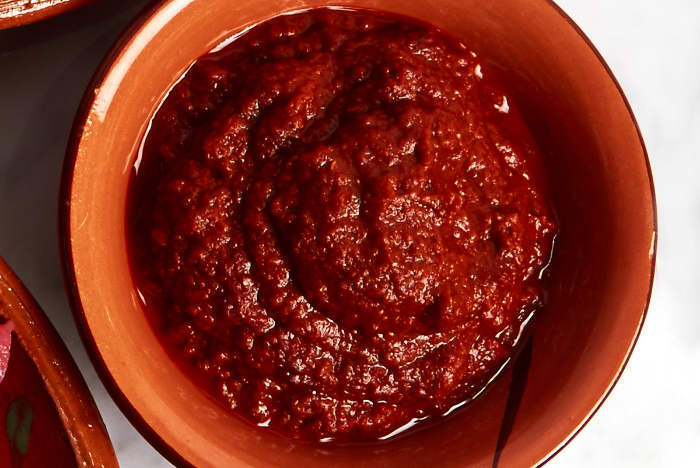 Add the charred tomato, onion, garlic and soaked chiles to your blender with 1/4 cup of the soaking liquid. 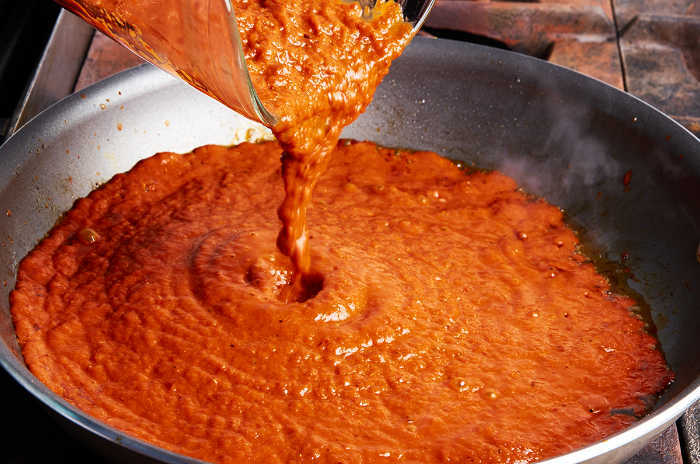 Add chiles, tomato, onion, garlic and soaking liquid to blender. Blend for 1 minute until the mixture is smooth but not liquified. After you have blended the adobo you must fry it. Preheat 4 tablespoons of cooking oil medium hot. Pour the adobo into the hot oil. Add the vinegar, sugar and, salt and stir. Fry the adobo in 4 tbsp. of oil. Cook the adobo until most of the liquid has evaporated and peaks form when you pass a spoon through it and it has the consistency of a paste. 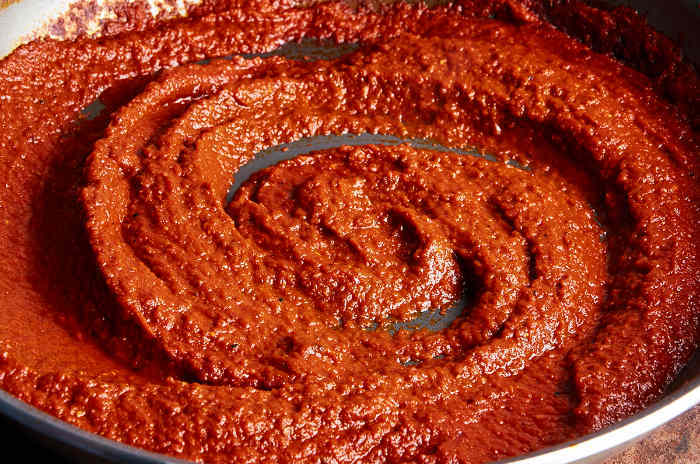 Rest the paste for 2 hours while the chicken is marinating in the refrigerator. Cook until the adobo forms a paste. You know this is going to be good! 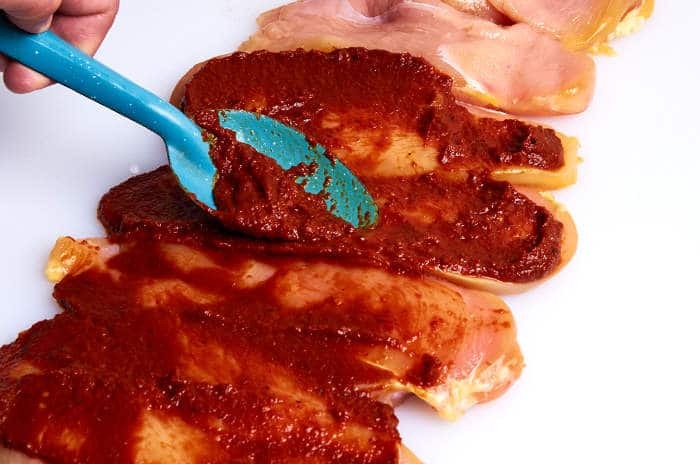 Guajillo chile adobo (wet rub) used to season chicken fajitas. 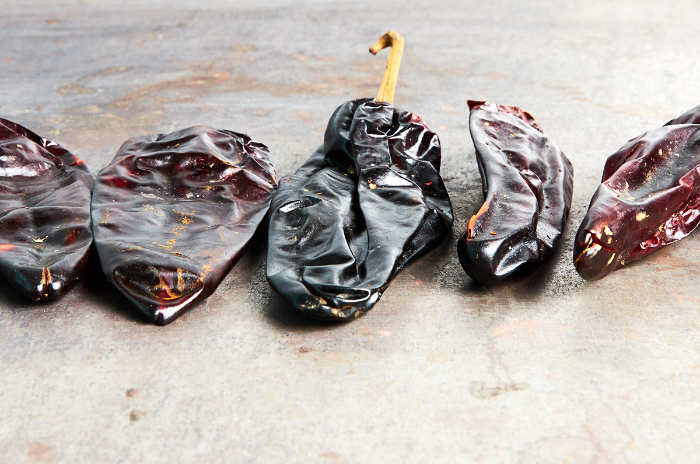 Toast the chiles in a dry medium hot pan for about 30 seconds per side until they are fragrant and pliable. 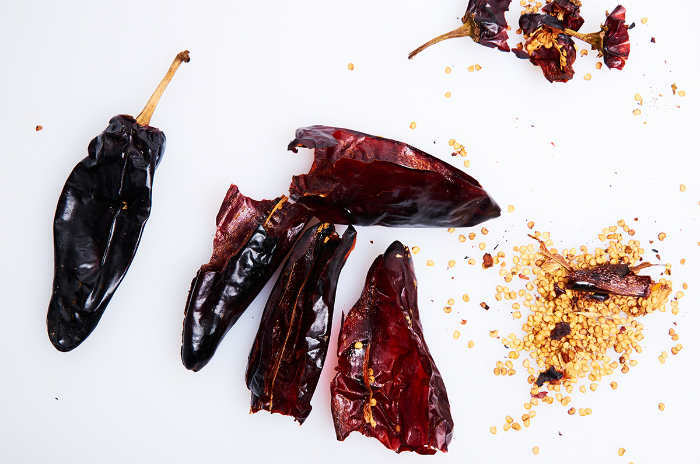 When the chiles are cool to the touch, remove the seeds and stems and discard. Place the toasted chiles in a pan and just barely cover with water. Bring to a boil the turn off the heat. Allow the chiles to soak for 15 minutes. Roughly chop the tomatoes and onion. In a preheated skillet with 3 tbsp. 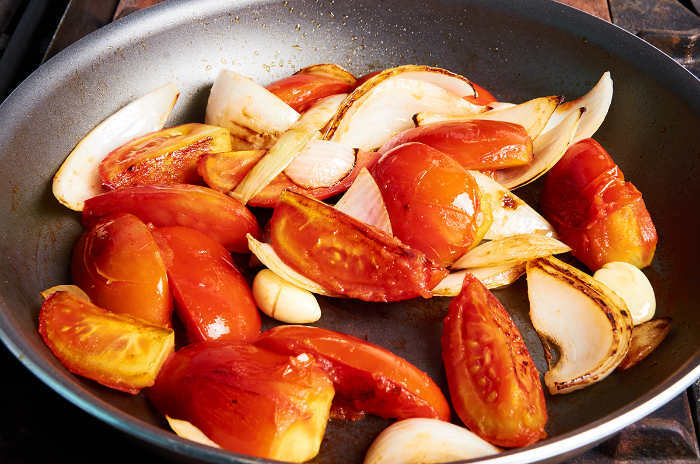 of cooking oil blacken the tomato, onion and garlic. 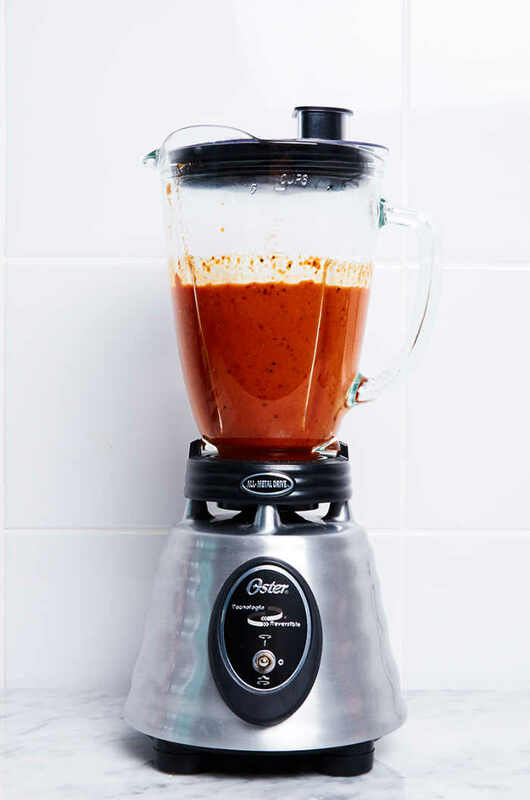 To the blender add the reconstituted chiles, tomato, onion garlic and 1/4 cup of the soaking liquid. Blend until smooth, about 1 minute. Preheat a skillet with 4 tbsp. cooking oil then pour the blended mixture into the skillet. Add the vinegar and the sugar. Stir to incorporate. Cook until most of the liquid has evaporated from the adobo and it forms peaks when you pass a spoon through it. Allow it to rest for 2 hours while the chicken is marinating. Slice the Chicken so that it is a uniform 1/2″ thick. This ensures that the chicken will cook evenly and some parts won’t be overcooked while other parts are undercooked. The presentation of the dish is also better because each slice of meat will be the same thickness. 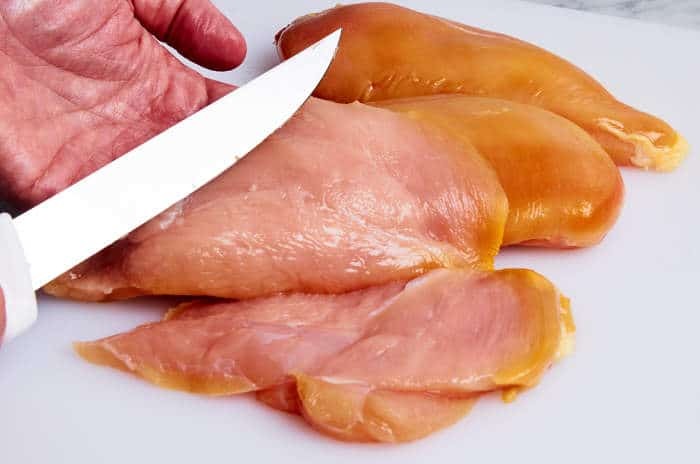 Slice the chicken breasts lengthwise. Aim for a uniform thickness. Salt the chicken breasts on both sides then rub both sides of the chicken breasts with the adobo paste. 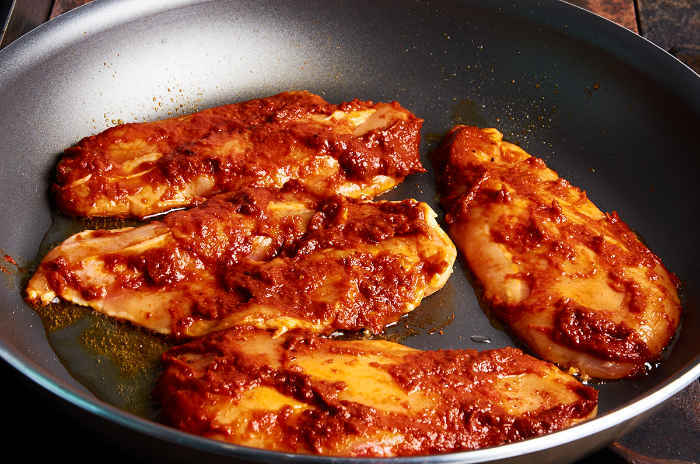 Rub the chicken breasts with adobo. Be sure each chicken breast is covered with a good amount of paste. It’s what gives the dish its flavor. Cover well on both sides. In the refrigerator, allow the chicken breasts that have been covered in adobo rest for 2 hours to allow the chicken to absorb the adobo flavor. Bring the chicken breast to room temperature before cooking. Preheat 4 tablespoons of olive oil. Place the chicken breasts into the hot oil. Don’t crowd the chicken breasts. Cook the chicken breasts in 2 batches. Cook the chicken in 4 tbsp. of oil. 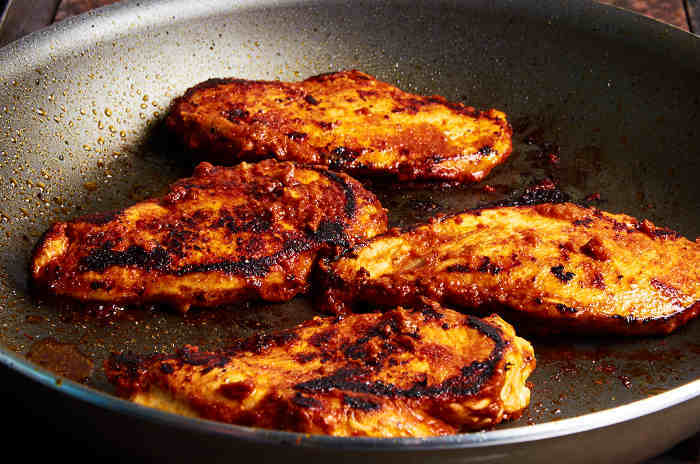 Cook the chicken breasts on each side until a nice adobo crust has formed. Hungry yet? Cook until a crust forms on both sides. Allow the chicken to rest for 5 minutes after cooking then slice the chicken into uniform 1/4″ slices. Allow to rest then slice into 1/4″ strip. Looking good! Follow the same steps to prep the chicken then cook it on the grill over medium heat. Grilled it will be incredible. Allow it to rest 5 minutes before slicing. 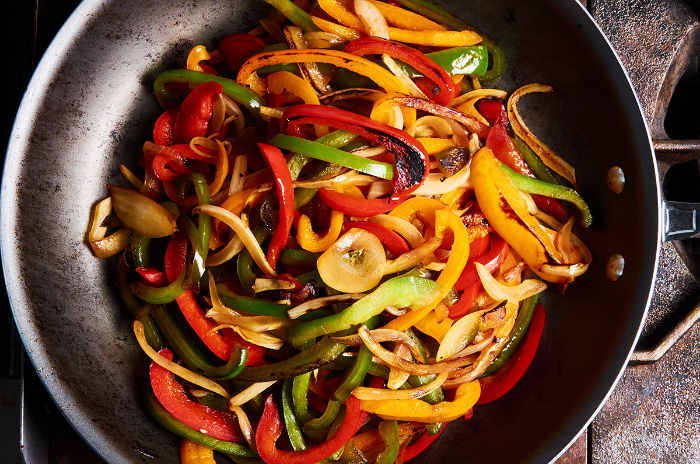 Cut the bell peppers and onions into 1/4″ strips. The more evenly you slice the vegetables the better your dish will be. All of the vegetables will be cooked evenly and will look great. 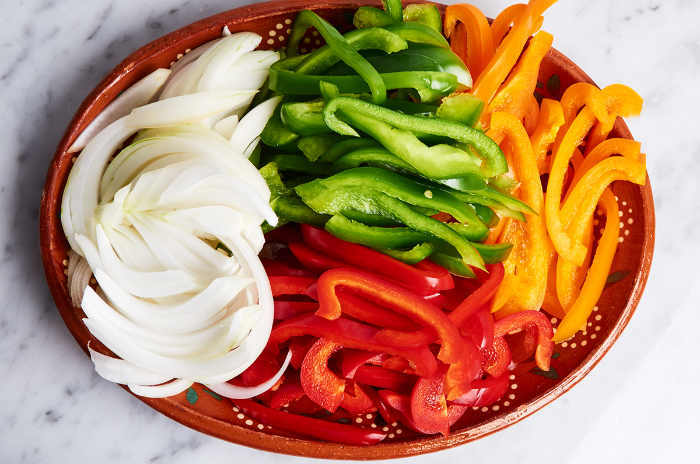 Slice the bell peppers and onion into 1/4″ strips. 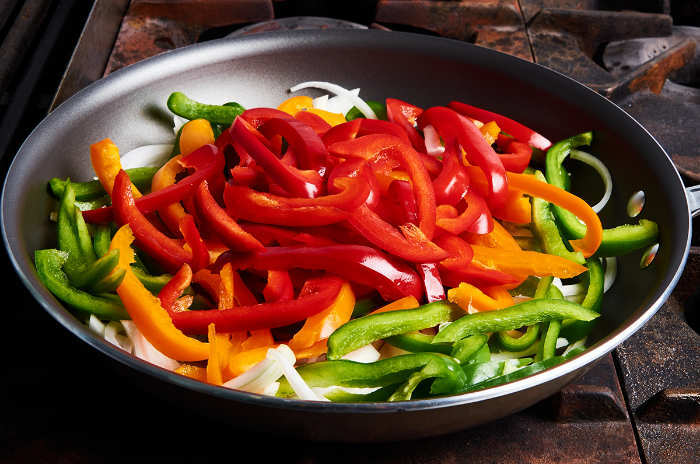 Stir fry the vegetables in 3 tablespoons of oil in a medium hot pan. Cook the vegetables until they are just cooked through and are starting to blacken. Don’t cook them so long that they become mushy. Cook until the vegetables start to brown and are just cooked. 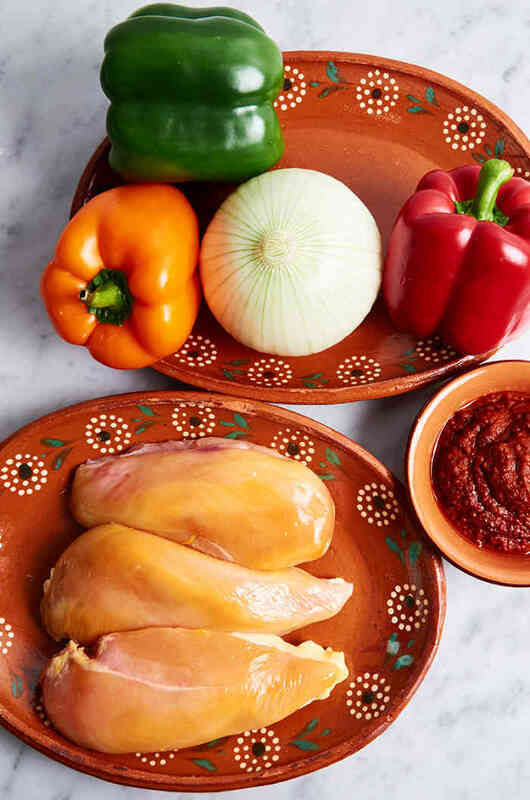 Flavor packed authentic chicken fajitas prepared with a guajillo chile adobo rub, a little sweet, a little smoky and with just a hint of spice. Great on the weekend for a crowd. Slice the Chicken so that it it a uniform 1/2″ thick. Season both sides of the chicken breasts with salt. 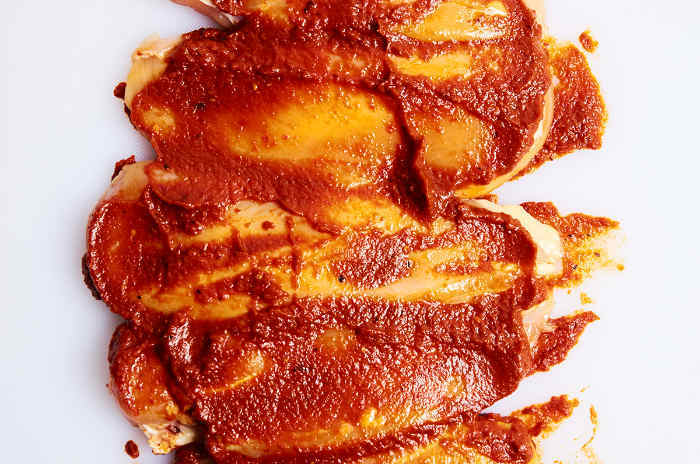 Rub both side of the chicken breasts generously with the adobo. 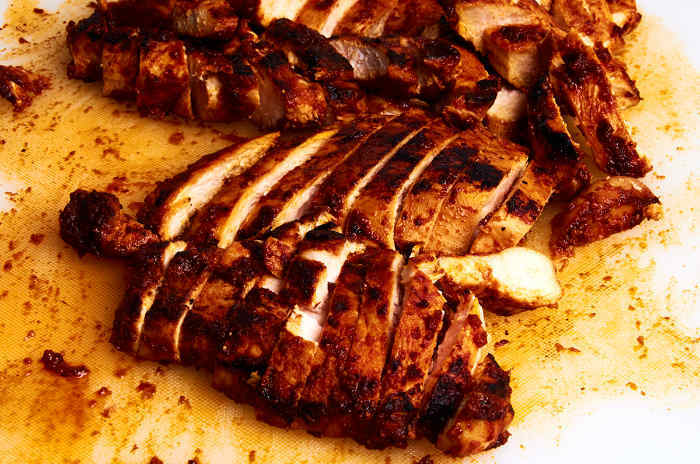 Refrigerate the marinated chicken breast for 2 hours to allow the flavor to penetrate. Remove the chicken from the refrigerator and allow to come to room temperature before cooking. Preheat 4 tbsp. of cooking oil to medium hot in a wide skillet. Cook the chicken until a nice crust has formed on both sides. Don't crowd the chicken in the skillet. It's best to cook it in 2 batches. Once the chicken is cooked, remove it from the skillet and allow it to rest for 5 minutes. Slice into even 1/4" strips. Slice the onion and bell peppers into even 1/4" strips. Preheat a wide skillet to medium hot with 3 tbsp. of oil. Add all of the sliced vegetable. Cook until the vegetables are just starting to blacken and are just cooked through. Don't cook them until they are mushy. Cook them to "al dente." Mix with a pinch of salt. Put the vegetables and chicken fajitas on a large serving platter. Serve with hot flour tortillas on the side. Warm the fajitas just before serving. 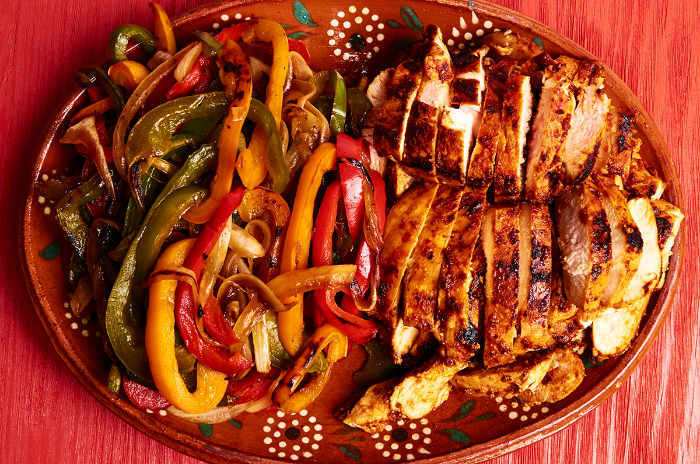 To serve, pile the chicken fajitas and vegetables on a platter. 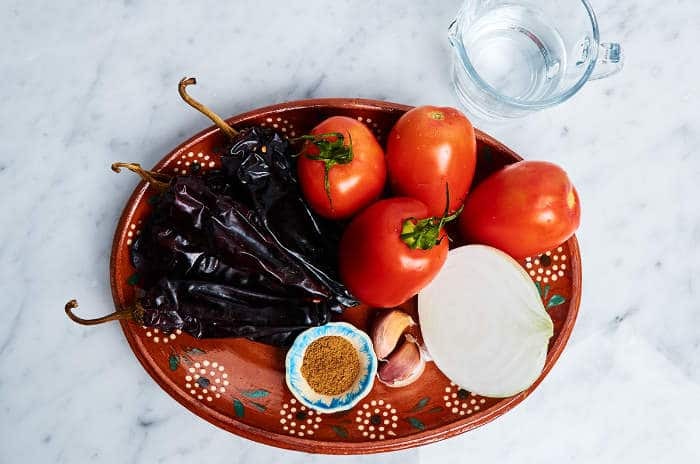 Serve with a stack of hot flour tortillas and your favorite salsas on the side. Ready to serve. Chicken fajitas in adobo with green, yellow and red bell peppers. We’re not fussy about plating them perfectly. This is a homestyle dish. 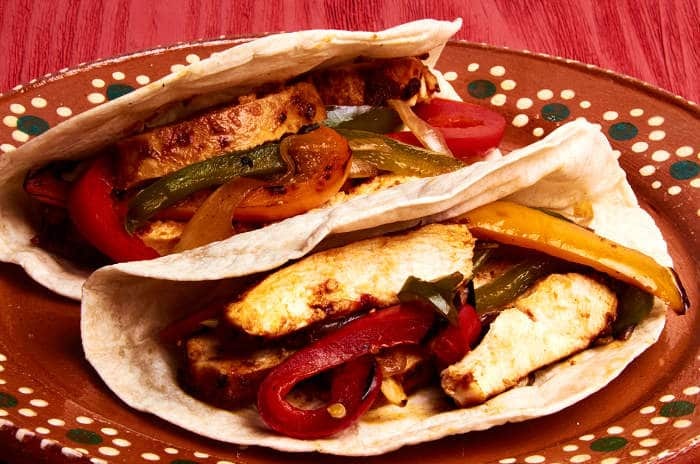 Some good looking chicken fajitas tacos just waiting to be eaten.